Born in 1996, Emily studied graphic design at Middlesex University and has had a passion for art from a young age. 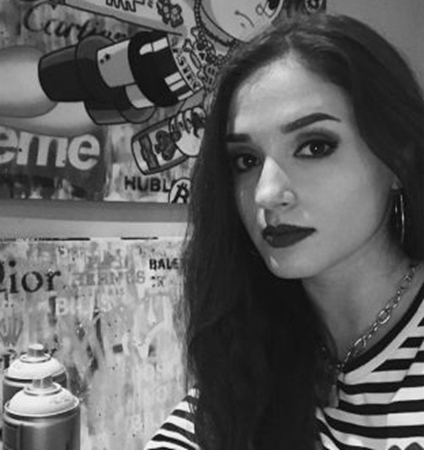 She takes her inspiration from fashion, culture, pop, and street art and fuses this together with iconic characters from her childhood. Her multi-layered pieces are first stencilled and spray painted to create the dynamic backgrounds, and then hand finished with acrylic paints to bring her chosen icon to life. These impressive pieces are not complete without adorning her characters with designer brands and luxury items. Each piece has a unique energy and satire and, as one to watch in the urban art scene, Emily’s pieces are selling out fast.